Steve Jobs said we are here to try dent the universe, while Facebook's (Mark Zuckerberg) original motto was “move fast and break things”. The idea being that if you did not break things you were not going fast enough. Never in our history have we advanced technologically as fast as we are now. The seemingly endless possibilities that new technology and digital products offered to address every challenge humanity faced failed to take the lesson we learnt with the creation of the first tools. It can work to help or harm. In the late-90s, the enthusiastic creators of the developing web focused on the potential good it offered, the reach and relatively small number of creators gave the impression that all was well. But as the web and its user base grew so too did the potential for harm, crime, invasion of privacy, cyberbullying, misinformation and just about any real-world vice to be replicated or even amplified on the web. The mobile phone's explosion and pervasive ability to capture everything happening on and around it make it both a powerful tool for good and the perfect weapon. By the end of 2018, few still think the web is an innocent place where trust is the norm. Instead, there is a growing concern that the system has inherent flaws created through oversight and based on the wrong models that make it potentially so corrupted that it will be hard to fix. Hard to fix problems is what inspired the initial creators. The next generation of creators plans to do the same but rather than only looking at the code implications they now have another guiding operating system - ethics. There are eight sections that it asks those creating new products to consider to anticipate how it could be used to harm before looking at how it can be used to help. The first distinction is that it is not only those tasked with actually designing the product or writing the code that has a significant role to play. Those determining the business case and the revenue model are just as important. If you thought that this was just a programming issue, consider the VW emission scandal (which is when we first covered this issue). Had VW not set itself a goal to deliver a high-performance diesel while also complying with the reduced emissions standards it may not have become an issue. To meet the marketing objective for vehicle performance it either had to overcome a significant engineering hurdle or use a software solution to defeat the regulators' monitoring. It was not only VW that had to decide what to do, but other manufacturers would also need to compete with VW. It may seem easy once the deception was discovered to pass judgement, but in the years leading up to it, and no doubt the many conversations about the best course of action, ethics did not feature as high as other considerations. 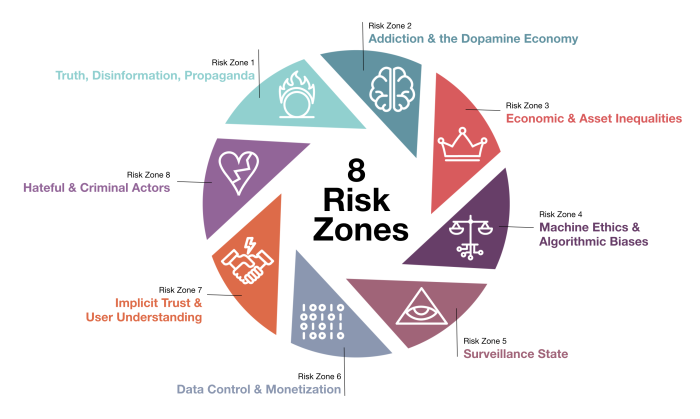 There are eight risk zones they list that, if carefully considered, should help avoid at least embarrassing and costly situations and potentially disastrous ones. There are also 14 scenarios to help note the kind of technology shifts and new possibilities that on the face of it are beneficial but may be used in unintended ways. Had this been available as Facebook made its shift to mobile and was used to inform the products they created for advertisers might they have avoided the scandals? It would be hard to say, but what we can say is that unless the innovation is matched with more consideration for ethics, Facebook and VW will not be the last or even the worst we will have to deal with. The Ethical OS is produced by the Institute for the Future and the Omidyar Network.